← Hand signals – a small/huge part of changing the world! My last post was over 3 months ago! The truth is that I could pull any number of reasons out of the atmosphere and any explanation would suit as well as the next! The fact is that this admission brings me to what has inspired this post over the week-end between the Republican and the Democratic conventions (which, full disclosure, I am observing part-time by way of MSNBC). What has dominated the media – even the mainstream media – are claims of truth and lies spoken from the GOP stage, and lots of punditry around this issue and how the Democrats need to respond. But before I go further with the politics, a bit of background related to my perspective on “truth.” The notion of truth has always puzzled me. Perhaps this comes from my early years in Hilo, Hawaii, growing up in a fundamentalist Christian household that proclaimed to hold “the truth” about just about any subject, situated in a community that was predominantly Buddhist. What came through to me as a young child from folks in in my community outside of my family was the possibility of many truths, and the honor in seeking what is true in everything. As I came of age and started grappling with matters of truth it was this message from my childhood community that seemed much more interesting, engaging, and authentic than the prescribed proclamations of a particular religion. This theme remained constant for me in my early academic career, when Maeona Jacobs Kramer and I wrote our book focusing on the development of nursing knowledge. Our thinking from the start held that scientific truth is not static — that the purpose of science is to fundamentally challenge what is thought to be true and refine the scientific evidence over and over again until, at some point, theoretical explanations of the world evolve to reveal fuller and deeper understanding, perhaps eventually establishing certain facts. Establishing political and historical “facts” requires a different, but essentially equivalent path – facts are established by reliable public accounts events, strengthened to the extent that each bit of evidence can be corroborated by other accounts of the same event. Still, I remain always alert to the possibility that some essence of “truth” can be found even in seemingly contradictory accounts of the same thing. I don’t like that conclusion. It doesn’t look “fair” when you say that. We’ve been conditioned to want to give both sides relatively equal praise and blame, and the fact of the matter is, I would like to give both sides relatively equal praise and blame. I’d personally feel better if our coverage didn’t look so lopsided. But first the campaigns have to be relatively equal. So far in this campaign, you can look fair, or you can be fair, but you can’t be both. 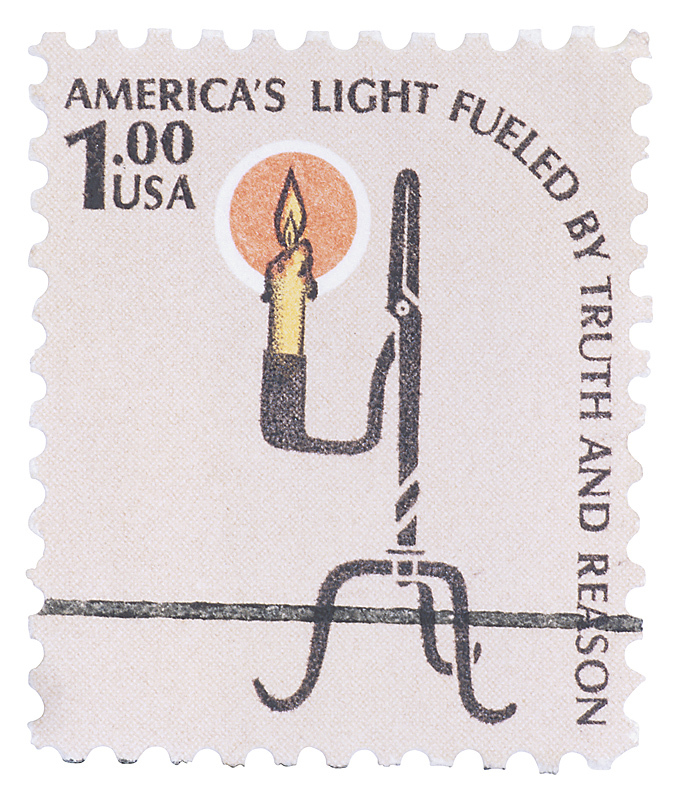 The 1979 commemorative “Americana” postage stamp on the left says: “America’s light fueled by truth and reason.” As Ezra’s essay points out, perhaps we are better served to seek that which is legitimate rather than what is “true” – and of course that requires a hefty dose of reason. And to me this adds up to integrity. Let’s call for a show of integrity. If we do not see it, let’s challenge those speaking. At the very least we should expect our politicians to own up to their “spin” and give us a legitimate explanation of the reasoning behind their claims. Of course, this is complicated. But I believe that real integrity can shine through very clearly, and this is what we need for our nation’s light at this moment in history. This entry was posted in Making change, Politics, Reflections, Social Issues and tagged @ezraklein, Ezra Klein, lies, pundits, truth. Bookmark the permalink. peggy – so clear as always – I do wish thoughtful commentary was more evident in what is being proclaimed by all politicians of all stripes! I resist the culture of fear that the US (and maybe even the world) has become and et, what may be true is that “you get what you resist”. I am deeply afraid of a republican presidency – and feeling increasingly helpless about what is touted as “truth”. Ah well, we shall see. A friend said to me “we survived ‘shrub’, we can survive Romney, but I’m not sure that’s true. Our generation of women takes for granted the right to vote, and seldom think about the women who fought and suffered and died for that right. This generation of women takes for granted the right to control their bodies, as if that right could never be taken away. I’m almost ready to dust off those old signs – DOWN WITH PATRIARCHY!!!!!!!! Now, more than ever. Peggy: thanks for adding light rather than heat to this topic. I had much the same response to my Pentecostal upbringing and am always skeptical of truth-claims and those who make them. It’s when rhetoric passes as truth, and critical thought is suspended to avoid muddying the waters, that human behavior can become reactionary and dangerous — particularly for those who refuse to conform.